It's only taken me about a year to realise that I don't really have a nice seating area for reading the paper and having dinner, so I set about coming up with ideas for what I could do. 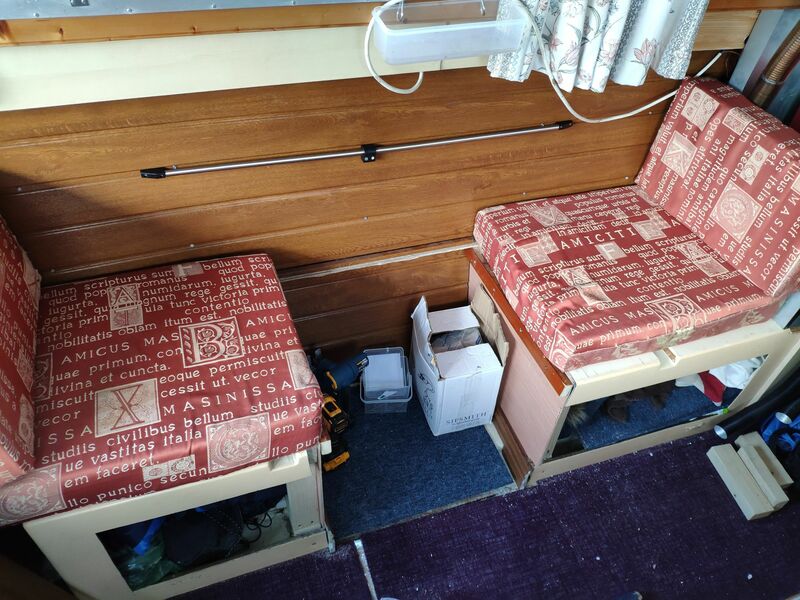 I came up with a plan to convert my 6ft sleeping area into a two-seater area with table which would also convert back to a sleeping area. OK, I can't pull it out to make it a wider bed, but I'm OK with that. 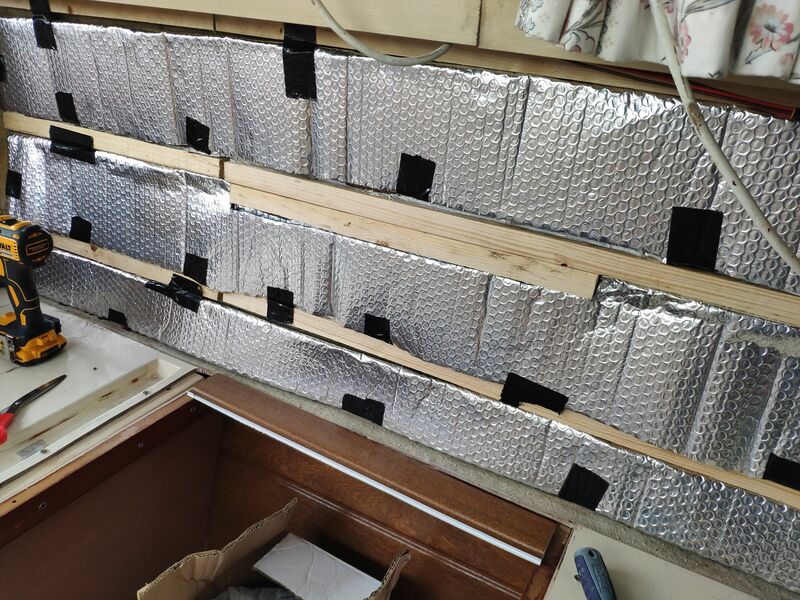 This weekend it was time to attach the cladding to the side of the boat, but how? 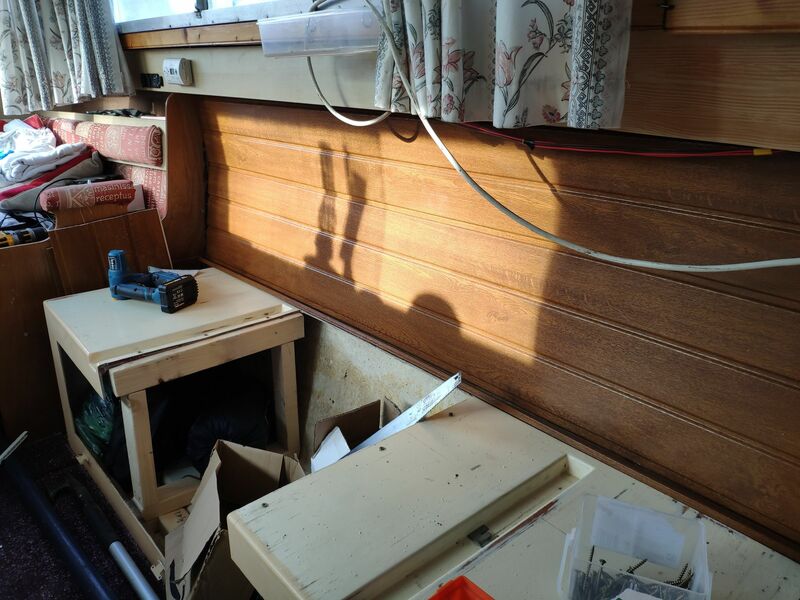 I can't just screw through the hull. Well, I could, but it wouldn't end well. 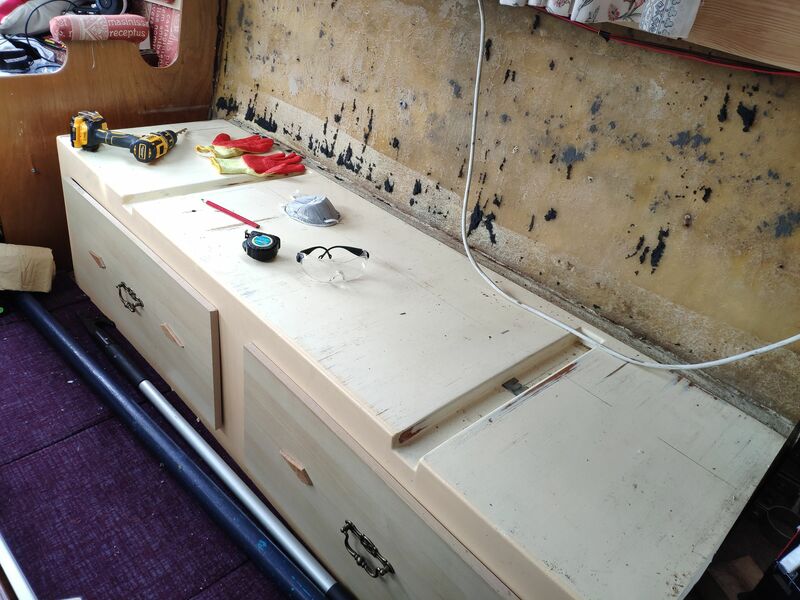 I decided to go with some wooden battens glued to the hull. Gorilla Grab Adhesive was chosen for the job. Seems pretty good so far. 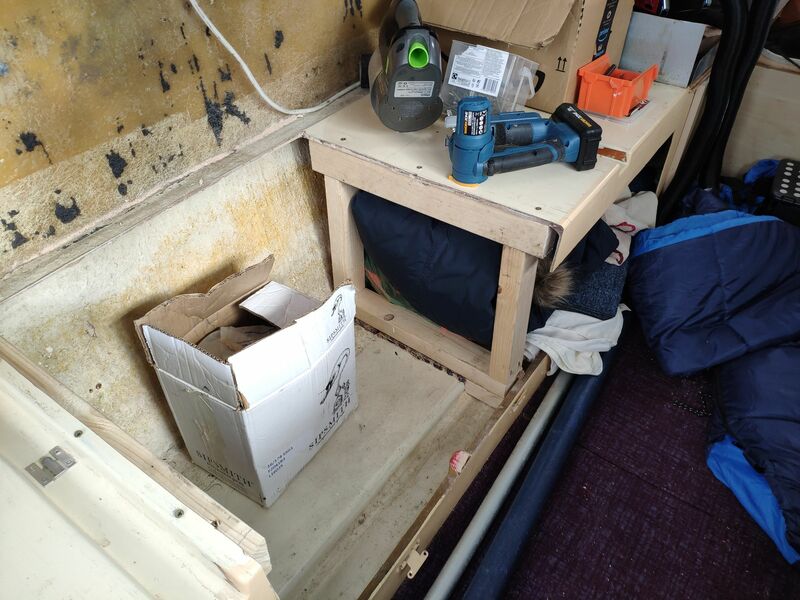 Oh, and I have to give a special 'shout out' to the £45 cordless jigsaw from Aldi. Absolute champ! 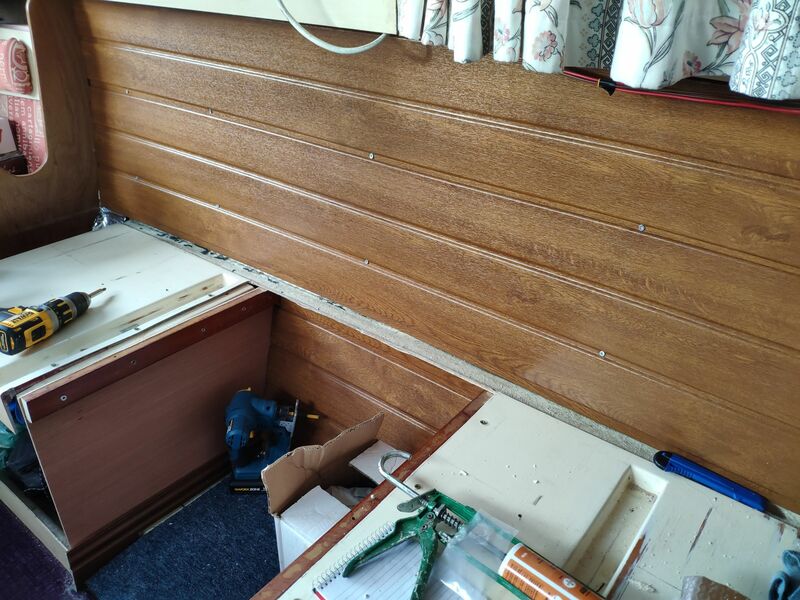 I've no leccy on the boat, so needed a cordless jigsaw. My only complaint with it is the seemingly blunt wood blade that comes with it. No big deal, fiver will get me some new ones from Amazon. 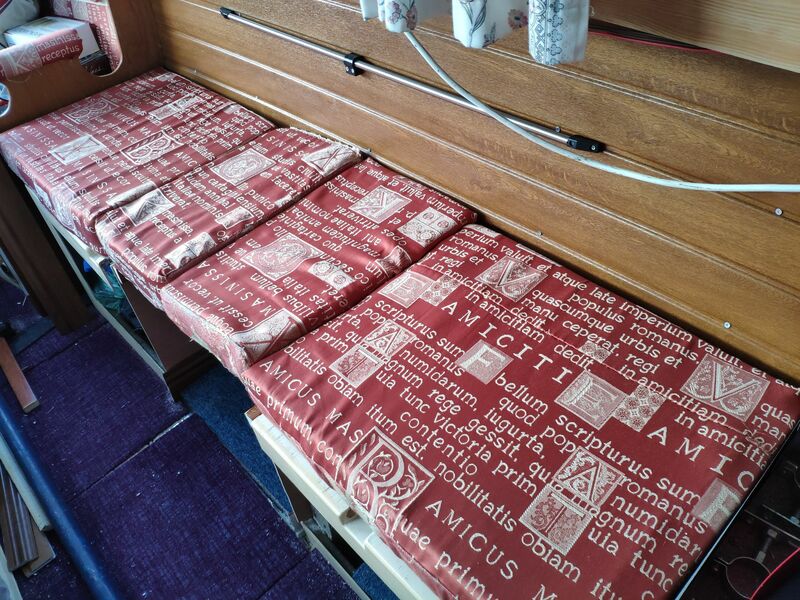 So, time to make the table for my seating area. 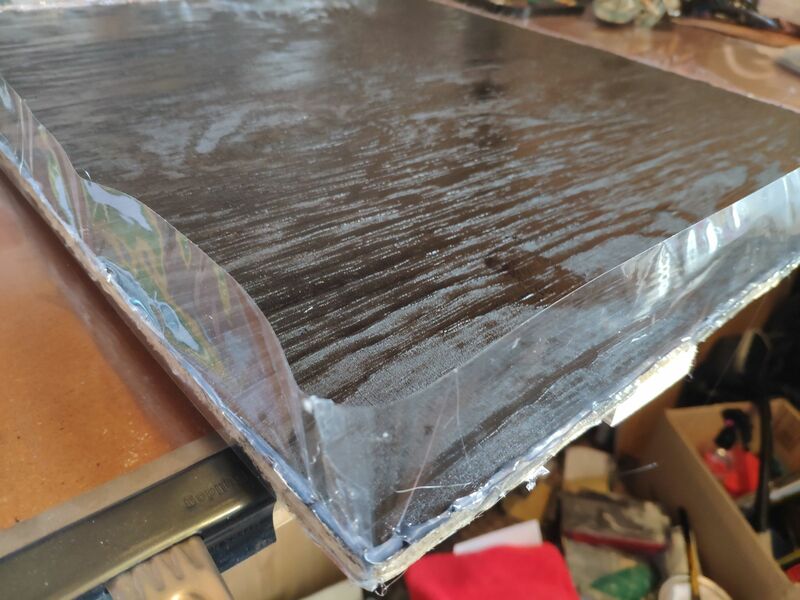 It's approximately 22" x 19". 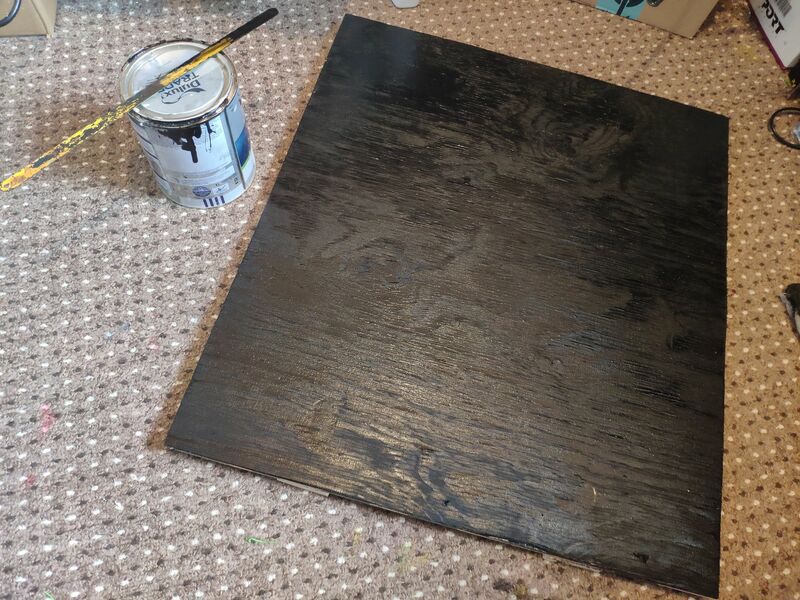 So I cut a piece of hardboard and painted it with a couple of coats of black gloss. 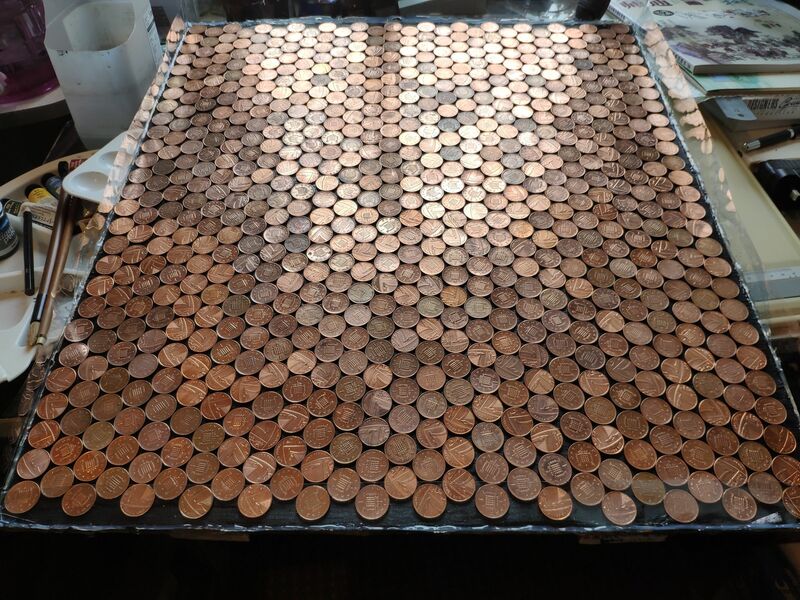 Next, the long arduous task of polishing hundreds of pennies. The trick here is to polish them all a bit, but not too much as you want them all different. You don't want every penny to be highly polished. With the £3 of pennies polished I began using hot glue to attach the non-tacky side of wide sellotape to the sides of the board. 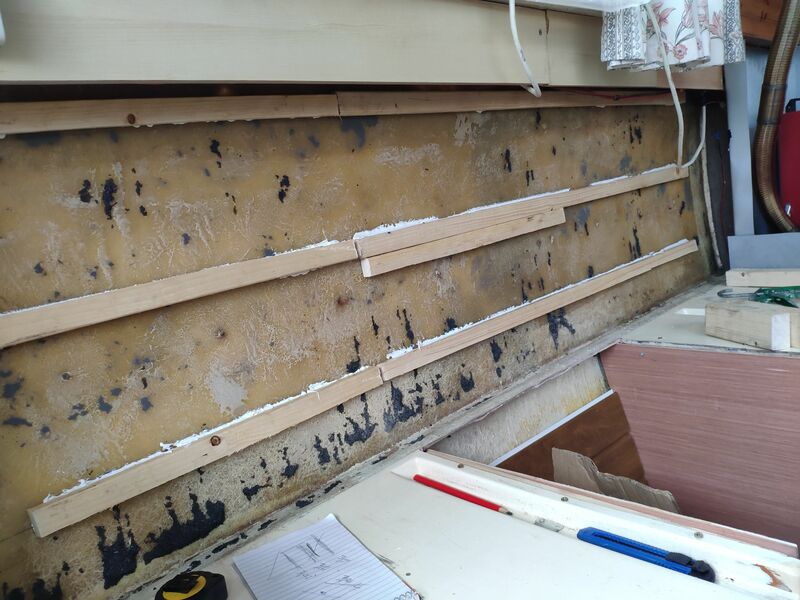 The idea being that the resin won't stick to the tape. If there are any gaps in the hot glue there'll be drips and drama later! So... let's get them pennies on the table! 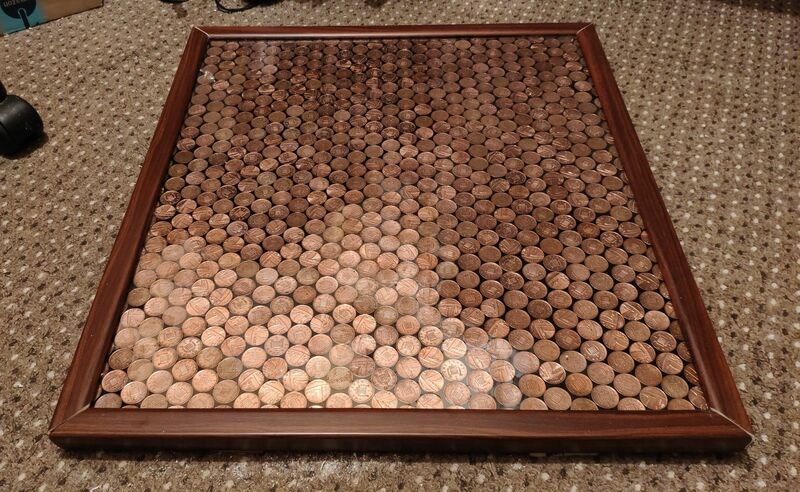 I think I MAY have underestimated the amount of pennies I'd need. 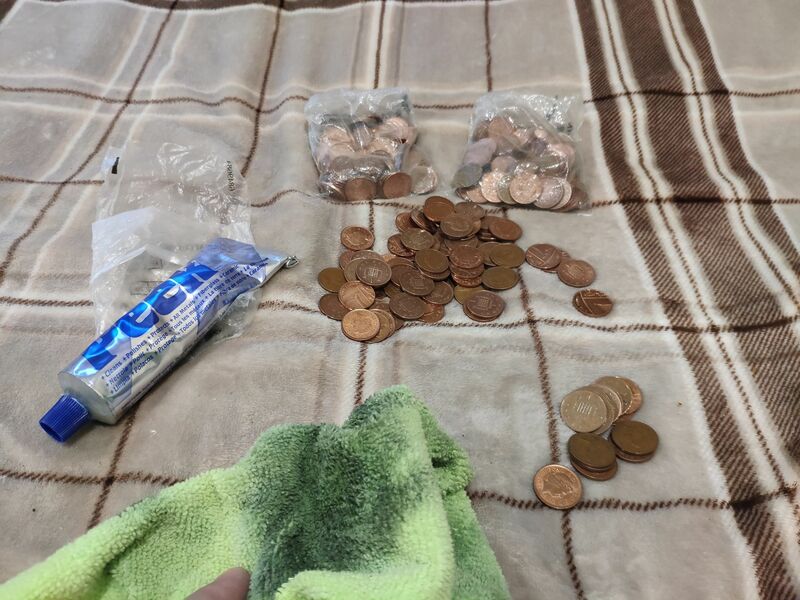 Having acquired several more bags of pennies. We shall resume service. Okay, I think I've plugged the leaks. There were a couple more, but I bunged them up with paper towel and anything else I could find. Now I had to spend the next hour babysitting this thing to hit it with a burst from the butane (kitchen) torch to burst any bubbles that appear. Don't be fooled into thinking that you've burst them all and can relax. Hell no. Those little suckers are hiding everywhere. Just waiting for you to turn your back, pop up to the surface and spoil everything. Seriously, I sat next to this thing eating my lunch to stay on bubble watch. 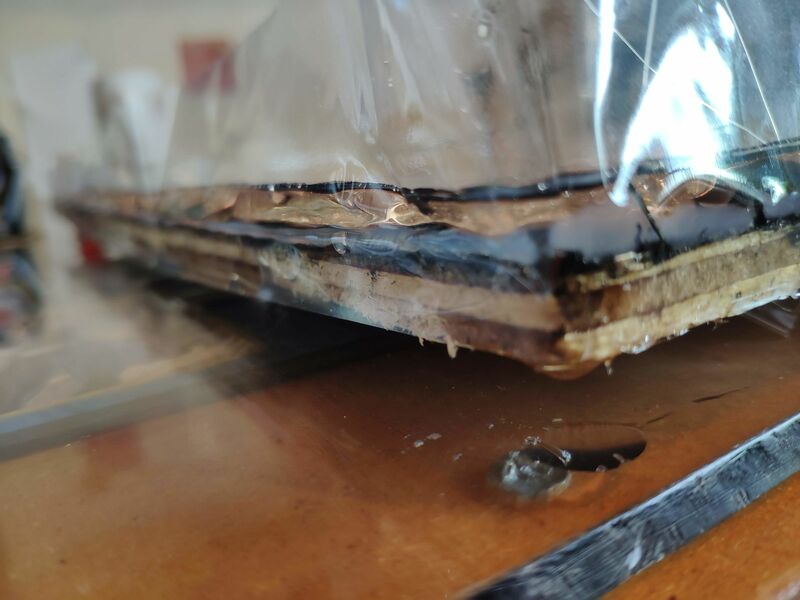 Once the resin goes really sticky then you can be safe that it's too thick for bubbles to now rise up. 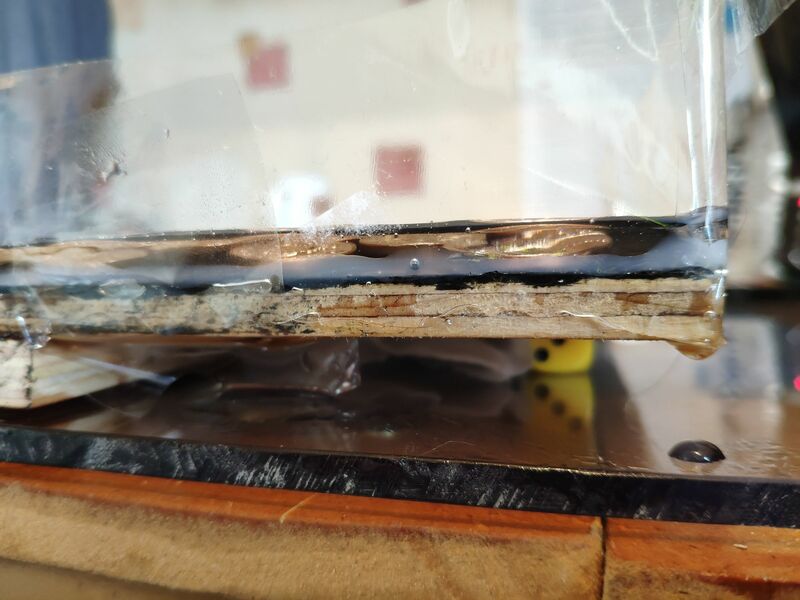 Now I have to hope that my table rod on the boat, and the single folding leg, can cope with the weight of this thing as it now has the weight of the wood, hundreds of pennies, and almost 1L of resin on it. 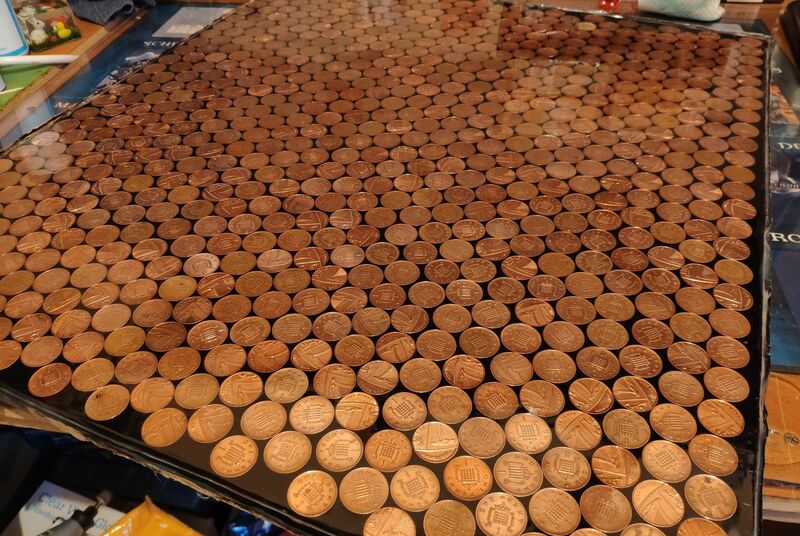 So... the question now is: to the nearest £1... how many pennies did it take to cover the table? 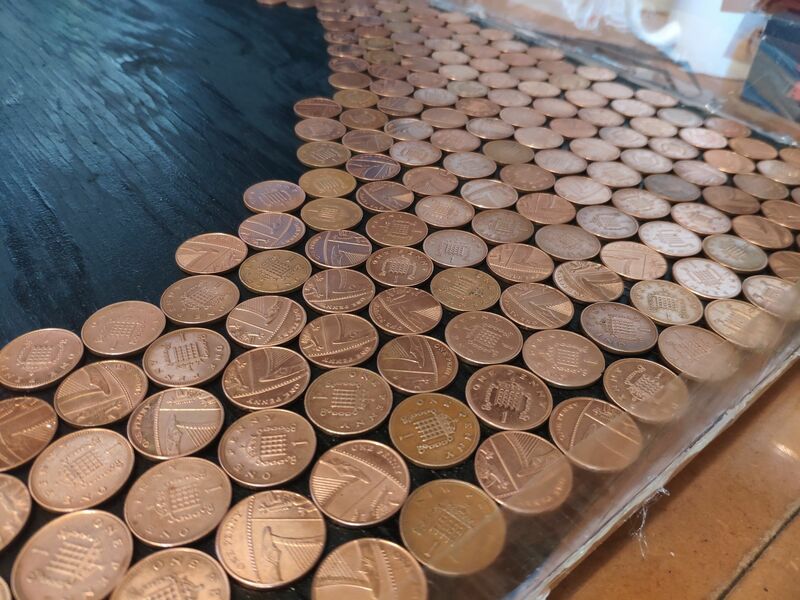 £6.76 of pennies, £12.23 of epoxy,£6.22 of wood,£0.88 of glue. The look on your face when the table leg snaps.................priceless! 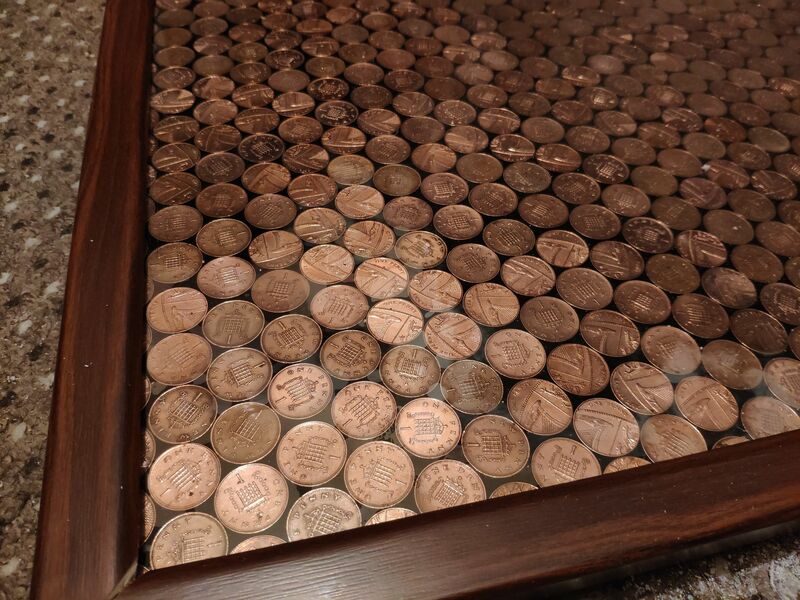 £8.10 in pennies. 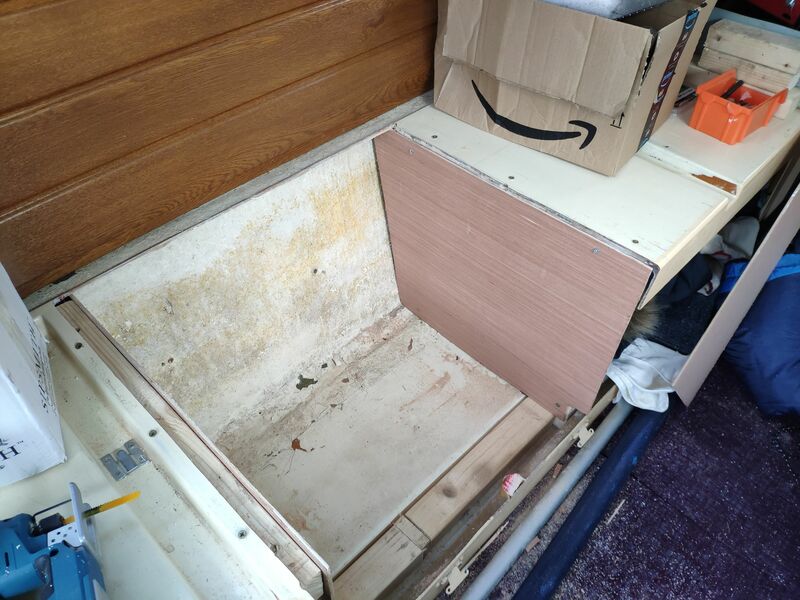 £12.23 of epoxy. 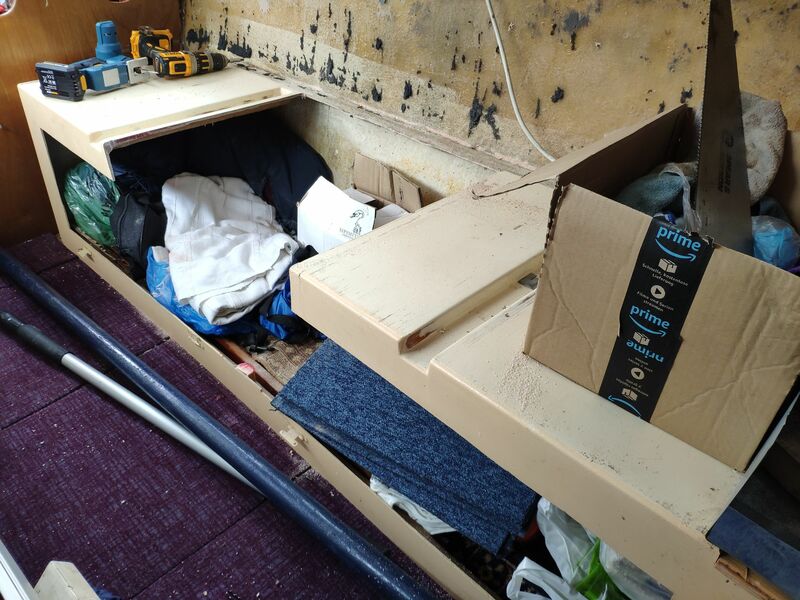 £6.22.of wood.£0.88 of glue. The look on your face when the table leg snaps.................priceless! Try double that for the resin, and not £8 in pennies. I have revised my penny count downwards. 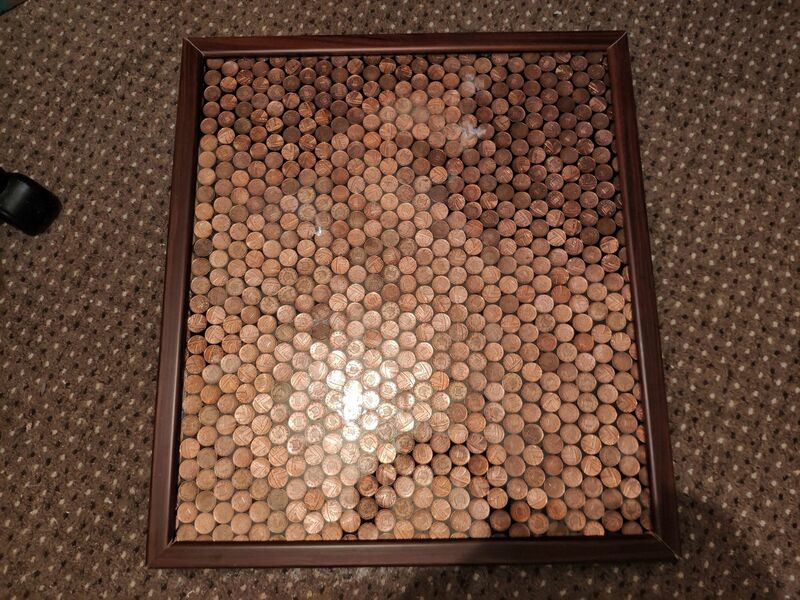 Slightly over £7 in Pennies? I can only accept your first answer. So I must have been slightly sadder I counted 2 rows and a column. 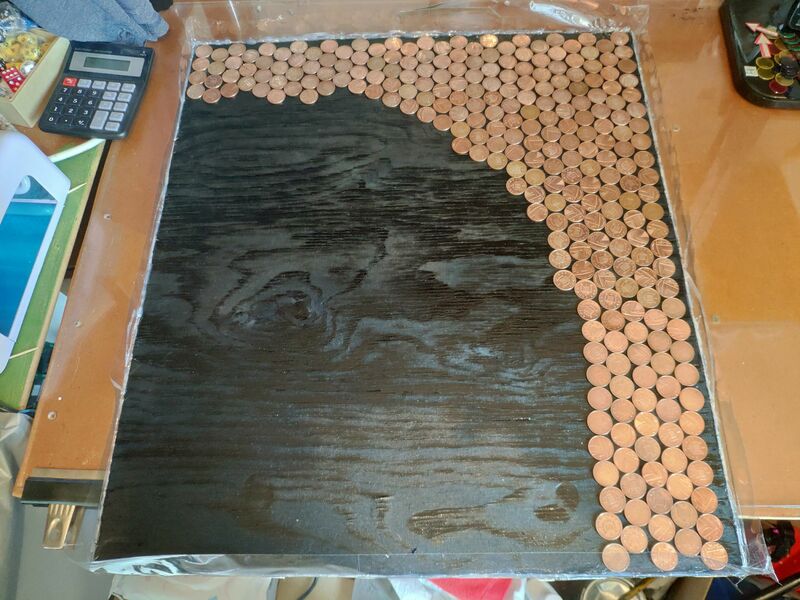 Then averaged the two rows and rounded the final figure down to whole pennies. It will be interesting to see the actual number. Did you allow for for the edge underlap? Yes but it was only a quick count so I may be wrong. 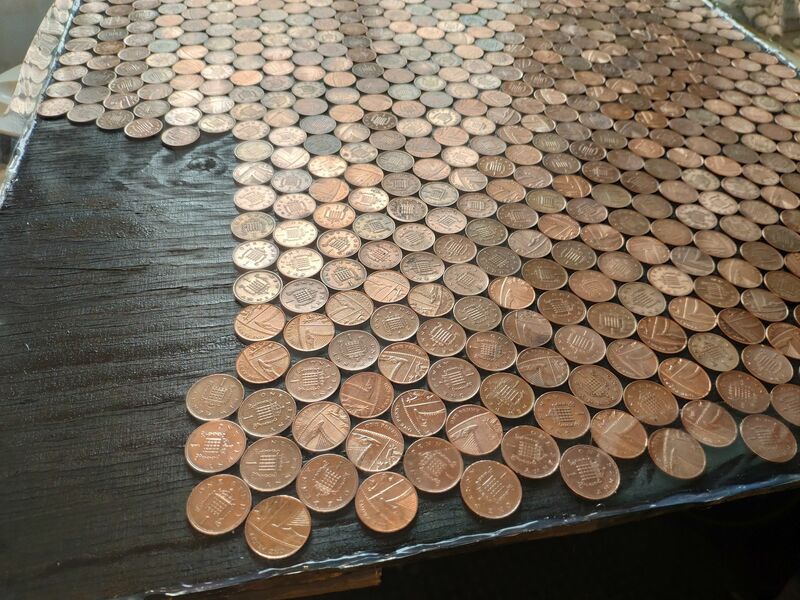 There are 27 columns of 14 pennies, and 26 rows of 13 pennies. A grand total of £7.16p. 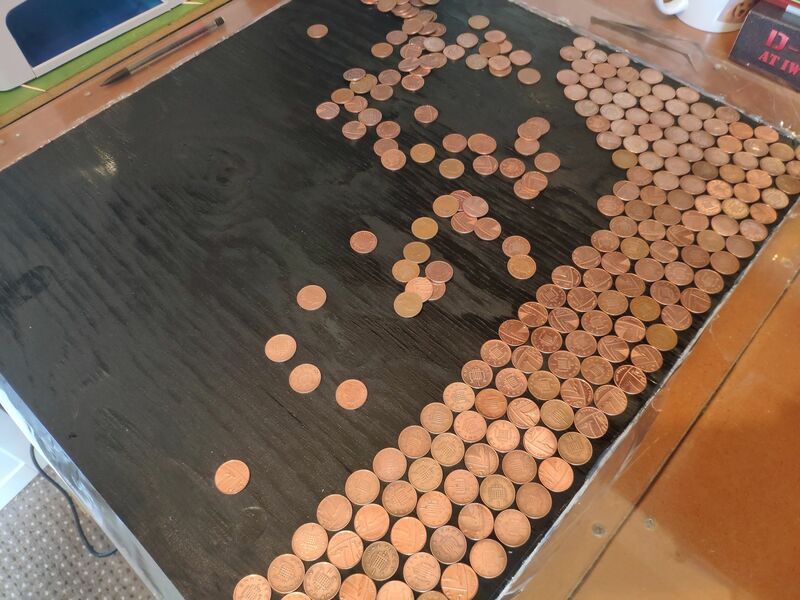 My initial guess was that about 3 or 4 pounds worth of pennies should cover it. Oh, how wrong I was! 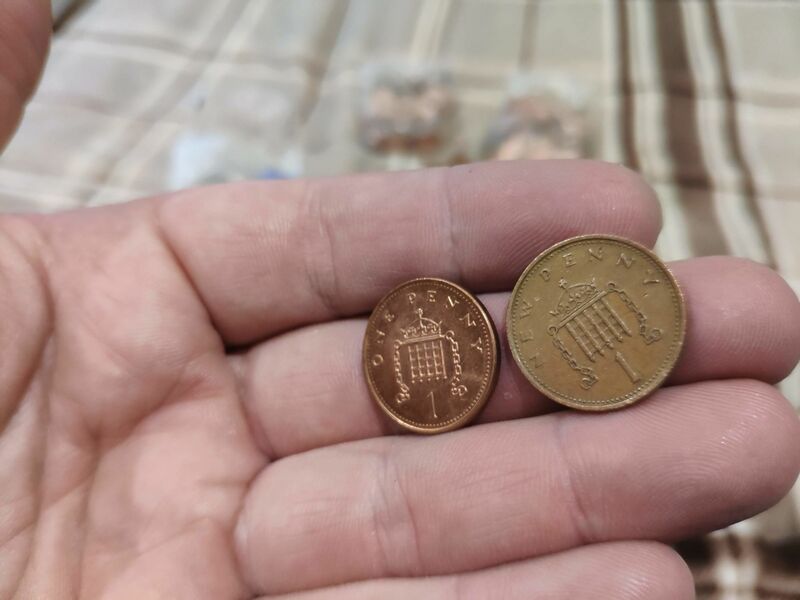 Cleaning copper coins is just a quick dip in vinegar, isn't it? 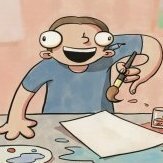 Maybe, but I used Peek polish. It's good stuff. 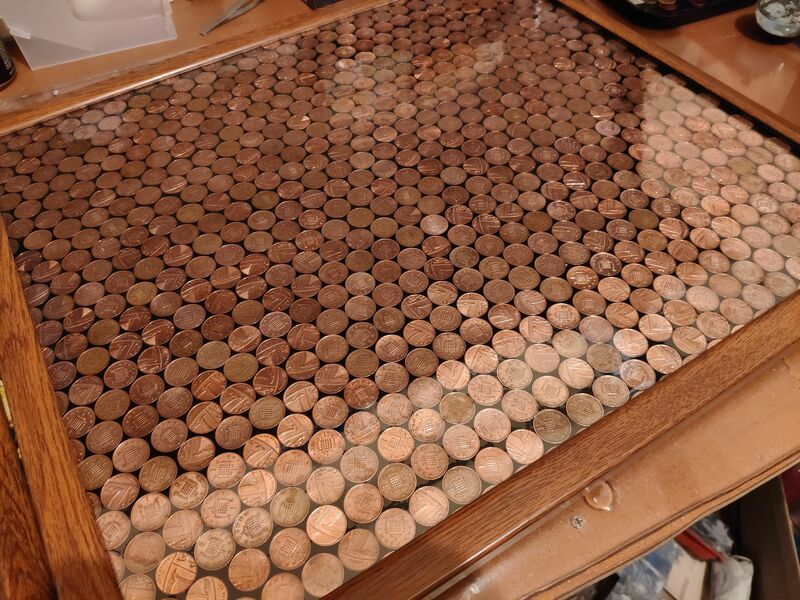 The penny table is pretty much done. I just need to put the clips on it (for the wall mount) and the leg (for the other side) and hope that it's not too heavy.